Twin-wire arc spraying provides versatile, economical and fast method of rebuilding and coating a variety of surfaces. It can be used in a variety of locations. All wires supplied by Alloys International are specified exclusively for arc spraying. All come on precision wound spools. The following is a brief summary of arc spray wires available. For further technical expertise please contact our sales team. AI-1800 Nickel, Moly Aluminium superbond wire developed specifically for its high bond characteristics. 76MPa bond strength on blasted surface. As a bond coat under other thermal spray coatings onto any substrate. AI-1804 Machinable self-bonding Nickel based alloy. High bond strength and easy to apply. Bearing journals, pump plungers, worn parts which cannot be ground. AI-1805 Iron-based self bonding alloy with outstanding corrosion resistance and good machineability. 30% Chrome. Boilers, heat exchangers, petrochemical industry, pump housings, pulp and paper industry. AI-1822 Martensitic 420 high chrome stainless steel coating. Produces a hard, dance coating with excellent wear resistance. Difficult to machine. Requires bond coat. Bearing journals, hydraulic rams, pistons, bearing housings. AI-1844 316 Stainless steel wire designed specifically for arc spraying. Easy flowing wire. Requires bond coat. Any application providing a coating of corrosion resistant 316 stainless. AI-1850 Spray-and-fuse wire. Designed for subsequent fusing after application. Produces metallurgically bonded deposit with high wear resistance. Post fusing coating must be ground. 50-55HRC. Applications involving severe high stress abrasion combined with low impact at temperatures not exceeding 450°C. AI-1855 Austenitic spray wire made exclusively for arc spraying. Excellent corrosive properties and machineable. Where dense, corrosion resistant coatings are required. Seal rings, gland casings, valve plugs etc. AI-1860 Spray-and-fuse wire. Designed for subsequent fusing after application. Produces metallurgically bonded deposit with high wear resistance. Post fusing coating must be ground. 60-62HRC. Applications involving severe high stress abrasion combined with low impact at temperatures not exceeding 450°C. AI-1866 Low-shrink wear resistant steel wire made exclusively for arc spraying. Unlimited coating thickness without cracking. 220HB. Fully machineable. 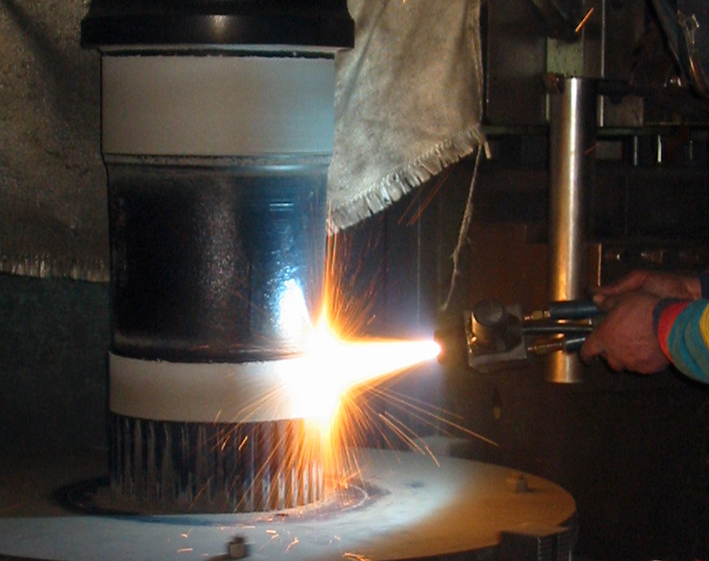 Bearing journals, shafts, any application requiring a wear resistant machineable coating. AI-1870 Hardfacing alloy designed exclusively for arc spraying. Hard, abrasive and wear resistant coating. Work hardens in service. Impressively tough for a coating this hard. Finish by grinding only. Requires bond coat. 53HRC Applications up to 950°C involving corrosion, abrasion. AI-1872 A self-bonding hardfacing alloy designed exclusively for arc spraying. Reduces overall coating cost by elimination of bond wire. Requires bond coat. Work hardens in service up to 53HRc. Applications up to 950°C involving corrosion, abrasion. AI-1888 Aluminium Bronze wire made exclusively for arc spraying. Self-bonding alloy. Reclaiming bronze components, protective layers on cast iron and unknown steel components, bearing journals and housings. Corrosion resistant applications. AI-1893 Pure Aluminium wire designed for arc spray. Self-bonding. For atmospheric and marine galvanic corrosion prevention of steel structures. AI-1894 Pure Zinc arc spray wire. For cheap protection of steel parts in-lieu of paint. Poor resistance to acidic corrosion.